The word myth has many meanings. It can mean a lie; it can also mean an oral legacy passed down from pre-recorded history. Myths are sometimes seen as history distorted by being passed down, and sometimes as metaphors and allegories for inner processes – stories that are symbolically but not factually “true”. The myth of Ariadne is, for me, the overarching story of what we face as women, within current dominant cultural norms. Working any myth, over time, reveals aspects of ourselves in all the archetypes in the same, single myth. Ariadne’s Thread, an inner Feminine commitment to live lives faithful to deep truth rather than the facts of the external prevailing paradigm? A reorientation of authority from exterior to interior is, it would seem, underway. “Entelechant” action is Feminine action and the story of Ariadne is about taking action in ways that enable women to come into their own, as fully as the reality of their circumstances allow. If a woman pays attention to her inner Ariadne and holds on to her Thread, Theseus is enlisted and takes “entelechant” action on behalf of a future they mature into together. But each has their own journey. We know much more about the Hero’s Journey. Ariadne’s story is the Heroine’s Journey and is more pilgrimage than adventure. 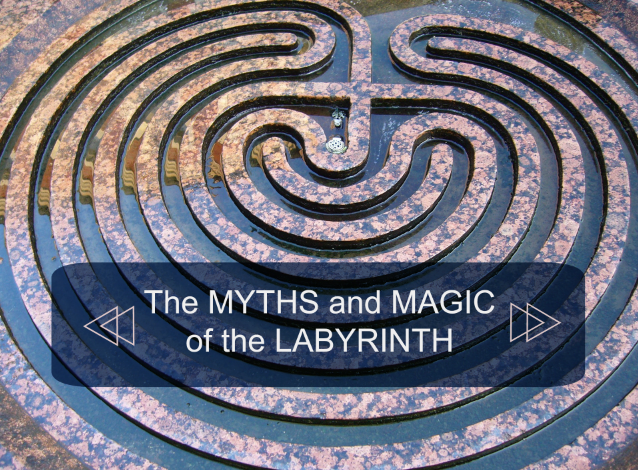 In the most ancient stories across many cultures, a labyrinth is a symbol of The Feminine and the journey or pilgrimage through birth to death and rebirth. The centre of a labyrinth is the place of both death and rebirth. This is the domain of the Great Mother, the mature Feminine in all her life-giving and life-taking aspects. It is a symbol of the womb within which all life starts, and the tomb where all cycles end. Any young woman, who can move through fear and uncertainty to take steps in the direction of her inner calling, even though it’s terrifying, will cross this developmental threshold successfully. Even when things don’t turn out the way she hoped (they rarely do), and even if she doesn’t get what she thought she wanted, she has been faithful to her Ariadne Thread and it grows stronger and thus easier to keep hold of. Moving out into the world, she’s on her own tracks, learning what it means to be central in her own life. She’s taken responsibility for her own entelechy, her own unique emergence and begins to build an alternative prevailing context for her own life. Fear can be a relentless driver and “driven doing” is familiar to most Westernised women. Life on a hamster wheel reacting to outer demands and the expectations of the prevailing culture leads to burnout and deep dissatisfaction. It is rampant in our society. What’s needed is commitment to a different kind of “doing” and “action” that is proactive on behalf of Ariadne rather than reactive to externals. Action that is always connected, by our Thread, in service of building new ground is the way the Labyrinth is reclaimed. The willingness to take action in our own lives and be responsible for the consequences of our actions, without blame and without expecting to be rescued, is Ariadne’s journey. And like Ariadne, real life often entangles other people in our Thread and things get messy. But it’s long past time to acknowledge that no one is coming to the rescue. 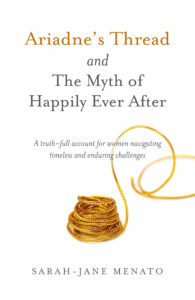 To find out more about Ariadne's Thread and The Myth of Happily Ever After, check out Sarah-Jane's book, details below. Sarah-Jane Menato lives in the UK and runs her own Gloucestershire-based coaching, personal and leadership development consultancy. She offers coaching to individuals and groups, specialising in working with women to define success on their own terms and build lives of authenticity and fulfilment. Her next workshop is being run in Compton Verney Art Gallery and Park in the Warwickshire countryside (UK). It will be a Labyrinth Celebration. How to take action on your own behalf - an ancient map for women today.